Pax Prime brought more news regarding SOE’s first of two sandbox MMOs, Everquest Next: Landmark. Something I have to admit, I was not expecting. Just a few weeks ago SOE had devoted a large portion of their own convention revealing EQN. Everyone would understand if SOE needed a breather before divulging much more. But, SOE is in tip-top shape it seems. I met with Dave Georgeson, Director of Development for Everquest Next, who took me through a few ways players will be able to experience the MMO. The fact that Landmark is indeed an MMO and not simply a world builder was something Georgeson continually stressed during the presentation. 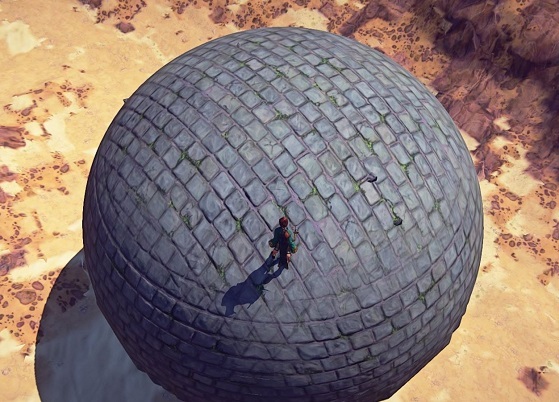 One such way Landmark remains grounded as an MMO stems from the player’s character. Just like in Everquest Next, Landmark will grant players a class. The adventurer class is awarded to all players within Landmark and will provide its own unique set of abilities. Just what those abilities are, SOE declined to say for now. Georgeson also spoke more about how easy SOE intends to make it for players to create visually compelling structures. In a timelapse video, Georgeson demonstrated how one player could make huge changes to an area in just 50 minutes. The video showed a player adding large rock outcroppings, with a red hot lava pool in the center and an apparently heat-resistant thorny tree to its side. The most surprising thing to me, was how well everything meshed together. 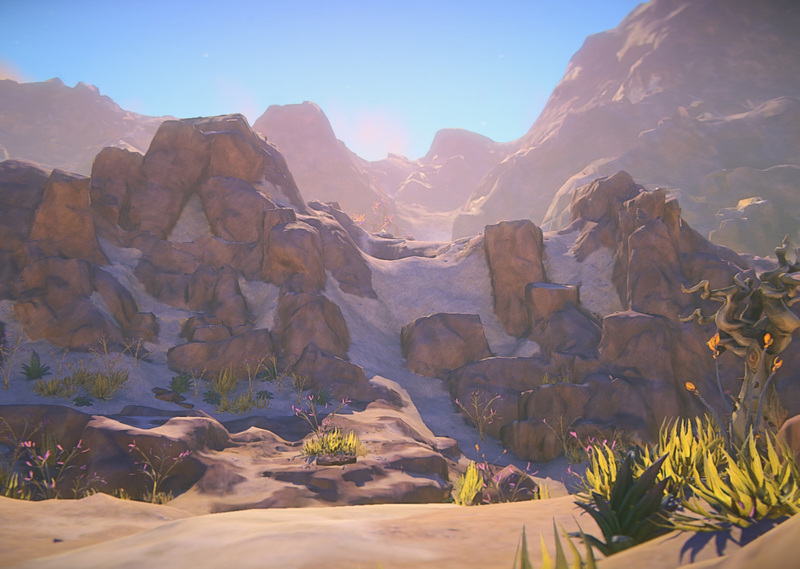 Due to the terrains voxel nature, shaping surfaces is quite easy in Landmark. But what SOE is really interested to see is what happens when players form huge co-op build outs. Normally a player must invite another player or his guild to join him in working on his plot of land. However, players will be able to form co-ops which allow players to come together in order to build in a location temporarily and trade resources without having to form a guild. Since Landmark is an MMO and not just a huge Minecraft server (confirmed by Georgeson), players will need to travel in order to participate in a friends build. Which brings me to what Landmark actually stands for. The Landmark in Everquest Next: Landmark refers to the locations in the MMO which serve as random starting points for all new players. By spreading out the starting zones, players must traverse the world in order to find their friends and discover new biomes. It also prevents singular areas from becoming overcrowded and constantly strip mined. Traveling is made easier with mounts and the parkour system which continues to improve dramatically. However, for players needing to travel across the far side of the continent or even to a whole new world, something a little more robust will be required. Enter the Wizard Spires, large structures which will give players the freedom to explore other communities uninhibited. Players will no longer have to claim one server home permanently. A feature I wish most MMOs will imitate from now on. Finally, Georgeson talked more on how players will sell their creations in the in-game cash shop. In short, players can package and sell everything they produce in Landmark. This means if a player wanted, they could package up their faithful recreation of Camelot’s castle and sell it and the land it resides on to another individual. A player can even package their claim up and simply move it to a new location if they so choose. Overall, I came away impressed yet again by how thorough SOE has been about every nuance of the EQN franchise. When you label a game as a sandbox you open yourself to thousands of tiny possibilities which may prove difficult to predict for. Every system shown in Landmark had an impactful tie-in with another. Georgeson had a clear design response for almost every scenario posed, no matter how specific the question. If Landmark’s progress remains as consistent as it sounds, Sony just might have something special on their hands. Okay so I don’t get this at all. 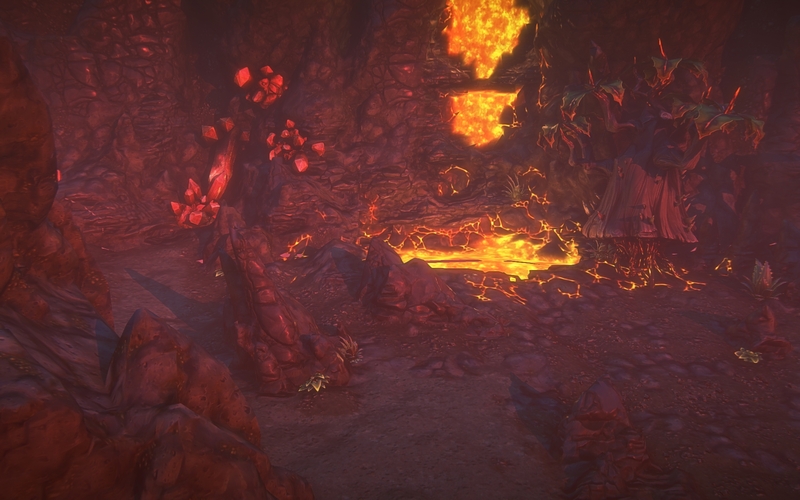 EQ Next is an mmo, but so is Landmark? What is the difference? Are there monsters and quests in one, but none in the other? I thought landmark would essentially be minecraft, but if its not… why have two games? Won’t that just split a potentially massive player base? Am i the only one who will make his own Epic Fantasy Sky House of Total Random Horrifying and Deadly Parkour Awesomeness? Will EQ next be free to play ? How much does EverQuest Next and EverQuest Next Landmark cost to play? EverQuest Next will join our family of free-to-play games. We will announce plans for optional in-game purchases via the EverQuest Next Marketplace and Station Cash in the future.